For a breezy yet sunny summer day, I enjoy wearing long sleeves with shorts, especially in San Francisco where your legs heat up from walking up all the steep hills! This outfit is colorful & playful yet sophisticated & not over the top. 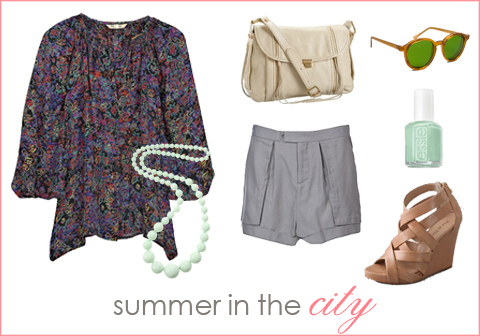 I love the contrast of a flouncy blouse paired with tailored shorts. Tucker Printed Silk-Georgette Blouse, $280 at Net-A-Porter. Helmut Lang Draped Twill Shorts, $230 at Farfetch. Rebecca Minkoff Beloved Cross-Body Bag, $595 at Endless. Pour La Victoire Tarissa Wedge Sandals, $290 at Shopbop. Spitfire ps135 Shades, $33 at Revolve Clothing. Oasis Miami Long Beaded Necklace, $24 at ASOS. Essie Nail Polish in Mint Candy Apple, $8 at Beauty.com.